In 2012, the Grande Maison in the Vallée de Joux is propelling watchmaking firmly into the third millennium. The Duomètre Sphérotourbillon is a truly original model uniting peerless technical performance, elegance and a spectacular complication, thereby meeting the expectations of the most demanding connoisseurs and collectors. Precision is the cornerstone of the Dual-Wing concept and was the watchword for the Jaeger-LeCoultre watchmakers in their reflection leading to the creation of the Duomètre Sphérotourbillon. 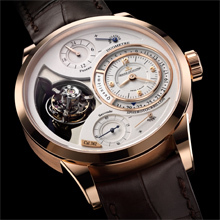 The result is a watch that can legitimately claim to be the first tourbillon watch adjustable to the nearest second. For what’s the point of precision if you can’t display it? There are indeed very few tourbillon models with an extremely readable display of the seconds in a dedicated subdial, and even fewer with a stop seconds device. Certainly none until now had ever enabled the user to stop the seconds hand and bring it back to zero in order to perform an ultra-accurate time setting. Using the Dual-Wing concept enabled the Jaeger-LeCoultre watchmakers to create the first precision-adjusted tourbillon. 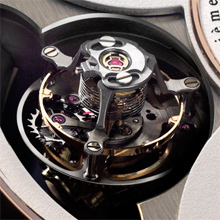 A push-piece at 2 o’clock serves to bring the small seconds hand positioned beneath the tourbillon back to zero, according to the flyback principle. One special feature of this flyback system is that it does not halt the operation of the regulating organ. The small seconds hand is reset to zero and begins running again instantly. This means the watch maintains optimal precision even when accurately adjusting the time to the nearest second. Above and beyond its exemplary reliability, the chief characteristic of this Sphérotourbillon watch, the fourth exceptional model in the Duomètre line, is its tourbillon. Initially devised for pocket-watches, the traditional tourbillon does not serve to compensate for the effects of gravity in all positions. An additional rotation axis must be added in order to achieve a three-dimensional rotation movement and thus prove itself more effective in all positions that a wristworn watch may adopt. The openworked dial provides a fascinating view of the tourbillon performing an extremely unusual rotation movement. As well as revolving around the axis of its titanium carriage, the tourbillon also spins around a second axis, inclined at a 20° angle. The combination of these two distinct and fast rotations (respectively 30 and 15 seconds per revolution) serves to free the watch from the effects of gravity. This spectacular tourbillon incorporates all the innovations that enabled Jaeger-LeCoultre to win a brilliant victory in the first official timing competition of the 21st century. The carriage machined from a single block of titanium features a combination of lightness and extreme precision. The cylindrical balance-spring with its two terminal curves beats with a concentricity impossible to achieve with a traditional balance-spring. The balance with its generous inertia oscillates at a cadence of 21,600 vibrations per hour. The balance-spring stud-holder is protected by a screw-locking system from the effects of shocks and vibrations to which the watch is subjected. For enhanced visual pleasure, a transparent caseback provides an admirable “backstage” view of the intricate working of the hand-assembled and decorated movement, Jaeger-LeCoultre Calibre 382. This technological complexity nonetheless remains extremely beautiful. The innovative spirit of the watch merges with an inspired design inspired by vintage pocket-watches and designed to endow it with a blend of elegance and refinement. The level of finishing of the ébauches made in non-treated nickel silver accentuates the sense of exclusivity exuded by the Duomètre Sphérotourbillon. Jaeger-LeCoultre’s signature “côtes soleillées”, clean-cut exterior and internal angles, harmonious shapes: the appearance of Jaeger-LeCoultre Calibre 382 is the very epitome of the watchmaking art. Demonstrating profound respect for ideal proportions and watchmaking design codes, expressed through the sophisticated pink gold case, the restrained, highly readable dial, the polished bezel and lugs, and the satin-brushed case middle, the signature aesthetic characteristics of the Duomètre are meticulously preserved in this model and create a striking contrast with the level of complexity of the movement housed within. 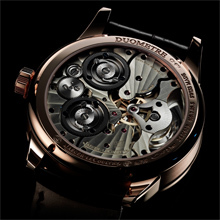 The Dual-Wing concept is reflected on the dial by the presence of two separate zones: to the left sits the opening revealing the secrets of the Sphérotourbillon; and to the left the main dial indicating local time and the date, subtly placed on a lower level all around the dial. An additional 24-hour subdial occupying the upper part of the dial serves to display the time in another time-zone, while the small seconds appear in the lower part. In developing this Duomètre à Sphérotourbillion, the first tourbillon accurate to the nearest second thanks to the Dual-Wing concept combined with the small seconds flyback function, did the Jaeger-LeCoultre watchmakers realise that they were in fact creating one of the most exceptional models of this early 21st century?